It’s pretty obvious by now that the Windows 10 Creators Update is going to be massive. Further affirming that reality is the release of a new picture-in-picture mode within the latest Windows Insider Preview Build 15031 released on the fast ring of Microsoft’s Windows Insider Program. 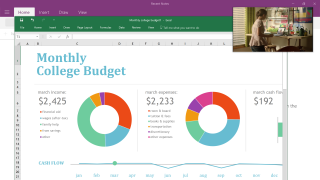 Dubbed by Microsoft as the new “Compact Overlay window,” the feature allows for you to push the contents of an app to a smaller corner of the screen that will always remain on top of other windows. But, seriously, was “picture-in-picture” somehow copyrighted? Fans of Android, iOS and most recently macOS Sierra have enjoyed features similar to this for months, so it’s exciting to see Microsoft catch up rather quickly. However, what’s important to keep in mind is that this feature is intended for UWA, or Universal Windows App, software only. This depends on UWA developers picking up the feature, much less creating new UWA apps or converting their existing apps to UWA to begin with. In other words, don’t expect to be able to take any old app and turn it into a picture-in-picture – sorry – Compact Overlay window when the feature becomes generally available later this year. Microsoft has also introduced a Dynamic Lock feature to Insider Preview Build 15031, which will automatically lock your PC when a Bluetooth-connected phone is no longer in range. When a said connected phone leaves the PC’s range, Windows will shut off the screen and the PC will lock within 30 seconds. Nifty! Though, why Windows Hello with a compatible camera couldn’t do this just as easily – as we previously hoped – is perhaps a mystery for another day. For the rest of the changes coming to Windows 10 via this new Insider Preview build, check out the Windows Blog.